The Coopered Tot: Octomore 4.1/167; peat monster or gentle cask strength dram? They sell inexpensive 30ml samples. I'll be trying a number of these over the coming weeks. I started with the Octomore 4.1 because the curiosity is burning in me - like a raging 167ppm fire. Nose: Peat (duh), but less than I was expecting. It's a clean simple earthy peat on top of some spirit heat, very reminiscent of Connemara Turf Mor - but more. There are iodine medicinal notes, and a slightly sweet vegetal quality like watercress, juniper, or gentle cilantro. With extended time in the glass some sweetness comes to the nose - integrated into the peat like sugar beets in the earth. Its a warm and pleasant nose - but remarkably simple and gentle considering the fearsome reputation that precedes this dram. Entry is richly sweet, razor sharp and big. Cereal sugars and rich malt toffee are the dominant first note. The midpalate expansion is like a rip roaring explosion. This is clearly a very young cask strength expression. Peat comes on like a wave at midpalate, but gently. The peat's presence builds and builds - first notes of peat in the earth with sea breeze above, then it evolves on the coated tongue into a rich savory of road tar, then ash, then finally a bituminous coal combustion note (that I've come to know and love as a characteristic of the new Jim McEwan Bruichladdich - and not just the peated ones. Even the unpeated Rocks expression has that coal note.) There is more going on here - vanilla notes from the oak are felt, and the oak is detectable on the finish. But sip after sip the peat marshals its forces and sweeps the field. The peat is gentle and late to arrive but this is the king of the peat monsters and its eventual victory is as inevitable as the tides or as the rise of the Sun after a long and dreary night. The peat grows sip after sip, slipping its tendrils into your nose and throat. As I work my way through my dram the peat begins to own every phase of the flavor blast - yet even in the road tar ash of the decaying finish everything is well behaved. It's not bitter or overbearing. It's powerful and yet graceful. The peat monster as a kind of Michael Baryshnikov. Scotch of this powerful cask strength suggests a drop of water. Doing so lightens the already light nose into a more subtle and even more youthfeel feeling state - not a benefit in my book. On the tongue, however, a drop of water moves the sweetness into a more heathery floral direction. The heathery ethereal meadow of the forepalate now floats above the roaring wall of massive peat that dominates the midpalate expansion and then settles back into the slow burn from earth to tar to ash on the palate that progresses in a stately manner over the next 3-5 minutes. How does this compare to the younger Octomores - or the 4.2 expression that came after? Not having tried them, I cannot say. Based on my extensive tasting of the Port Charlotte line (which has many similarities), however, I imagine that the vanilla note from the oak is stronger now and the intensity of the peat has diminished (scary). I look forward to learning more. 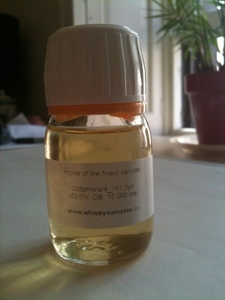 update 4/1: Octomore 0.1.1 and 4.2 Comus were recently reviewed (click on the links at left to see them). More 4.1, 2.1 and 2.2 Orpheus are in the house and will be reviewed soon. Look for more reviews and comparisons in the near future. "Not sure why, but the first release seems smokier and peatier, on the nose as well as in the mouth. Even though it’s not a bad dram, shouldn’t we conclude the new one is less impressively experimental and less true to the concept?" I don't have that baggage and just liked it for it's own sake. I did a brief compare with PC6 and PC7 - which are close in proof, if only 1/4 the peat levels (still very high). The PCs seemed much thicker in body and had more grain richness. 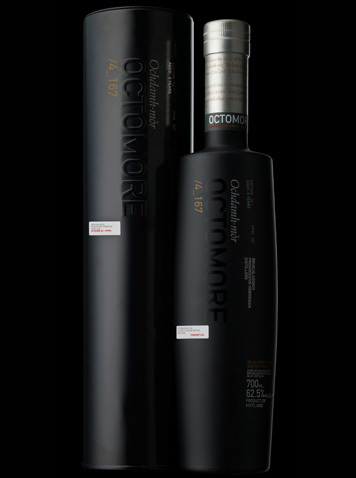 The Octomore 4.1 took the PC strengths of intense sweet and peat further, with less of the central grain "body" in between. I liked that intensity - and appreciated the lightness of it that kept it from getting too intense. I suspect this will appeal to most peat heads - even if they prefer the more obviously peaty side by side. One more thing - it comes in a 700ml bottle (not the usual 750ml). This stuff is very very expensive.